Sometimes, we need a surprise up our sleeves. An extra card in our deck, a furry rabbit hiding in our hat- anything to make our audience think we’re all but magical. Friends, I may be short on trick mirrors and trap doors, but this super simple, make-ahead mint brownie ice cream cake is for sure going to be the disappearing act at your next dinner party. It’s that awesome. So let’s get to it! 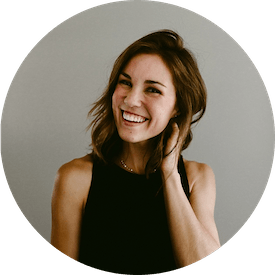 You probably already know how much I love no-churn ice cream. There’s always a quart or two in my freezer, because the only thing better than homemade treats is one that is only three ingredients and takes less than 10 minutes to prepare. It makes me feel domestic and awesome, and we all need that sometimes, right? But when I’m looking for a showstopping dessert to share at a gathering of some sort, I want something with a bit more pizzazz, you know? Something that makes everyone lick their plate and exclaim, “SWEET MERCY, WHERE IS THE ANGEL THAT MADE THIS! 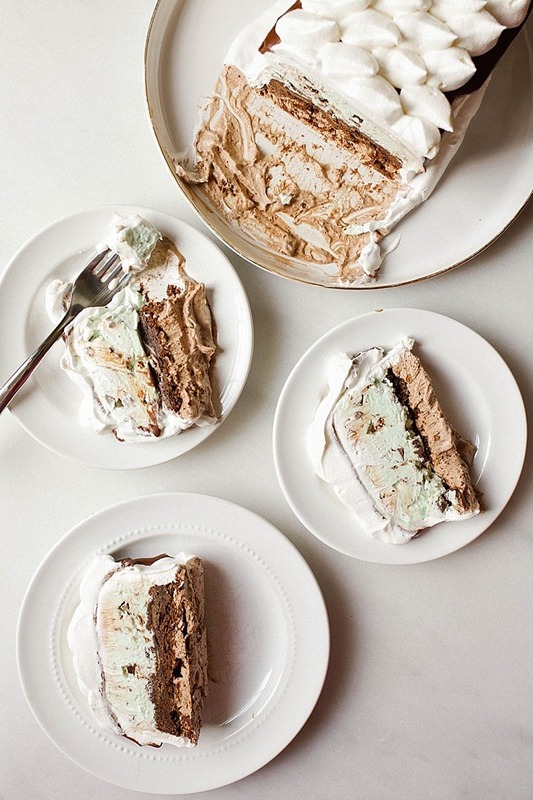 ?” Mint brownie ice cream cake is the best of both worlds. The cake is delicious to taste and easy on the eyes, but with only three steps, this recipe is also nearly fool proof, with multiple options for simplifying and making ahead. Let me just go ahead and give you the run down. If you’re reading this baking blog, it’s safe to assume you’ve made brownies before. I’ve included the recipe for an easy brownie that I use for frozen desserts, but you could totally use a box brownie mix or even (gasp!) store bought ones. I won’t tell. And your taste testers will have no clue. Promise. Step two: make the ice cream. If there is something easier than making no-churn ice cream, I don’t want to know. Pour the sweetened condensed milk and heavy cream into your mixing bowl and you’re literally already halfway there. For this mint brownie ice cream cake, we split our ingredients in half to make two flavors (because options, duh): a chocolate ice cream and a mint chip ice cream. If you don’t like mint chip ice cream, you can lose that flavor extract and use hazelnut instead. Or how about coconut? Almond? Root beer? Whatever, just use whatever flavor you want, ok? If you’re looking for an ice cream substitute though, I can’t help you, and honestly, we are probably no longer friends. Just kidding. We can still be friends. But don’t push it. Step three: assemble your cake. This is probably the hardest part of preparing this mint brownie ice cream cake. If you’re like me and are a bit of a perfectionist when it comes to the looks of your treats, this step will require some attention from you. At this point, you have the option of preparing a chocolate ganache to layer on the inside and garnish the outside of the cake with. You can also crush up some chocolate sandwich cookies if you want an extra layer of crunch in your masterpiece. Either way, you layer the ice cream with the prepared brownies, and before you can say “Bippity Boppity Boo,” your bag full of ingredients has transformed into this fab mint brownie ice cream cake that will impress the glass slippers off of everyone you know. So in short, if you want to make this cake 100% from scratch, you will prepare your brownies, whip up some ice cream, and layer the two with some homemade ganache and whipped cream. But if you want to take easy street, you simply acquire brownies, make some ice cream, and dump it all into a pan with some store bought fudge sauce and chocolate cookies. 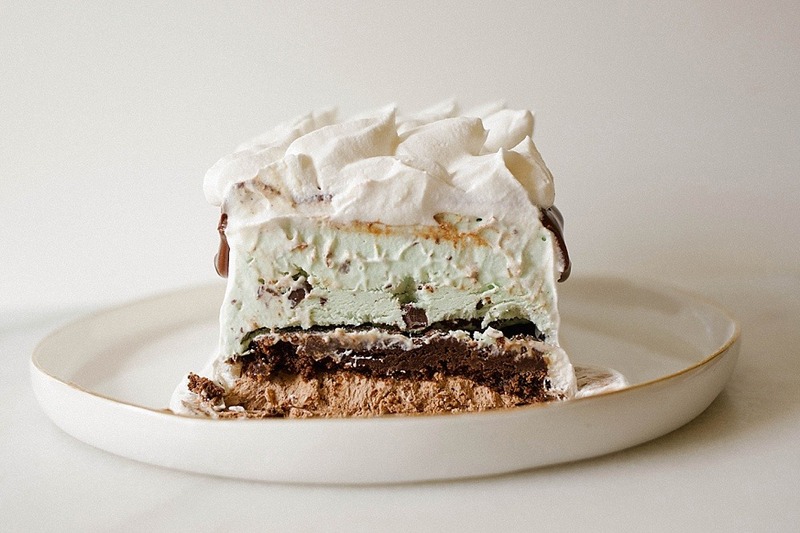 Literally, the hardest part of making this mint brownie ice cream cake is waiting patiently for it to freeze up. Literally. Our #monthofchocolate extravaganza has been pretty fun these past few weeks. 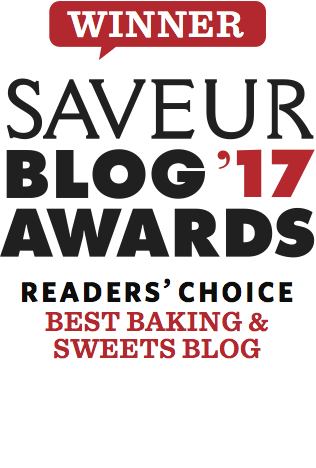 Be sure to look back at the past few blog posts for other chocolaty goodness and recipe inspiration. Somehow two mint chocolate recipes made it into the lineup, which either means I really like mint, or I’m secretly pregnant again (just kidding, Mom, I am not pregnant. Don’t get too excited.) March may have a bit less chocolate in it, but like any self-respecting addict, I won’t be able to stay away for too long. 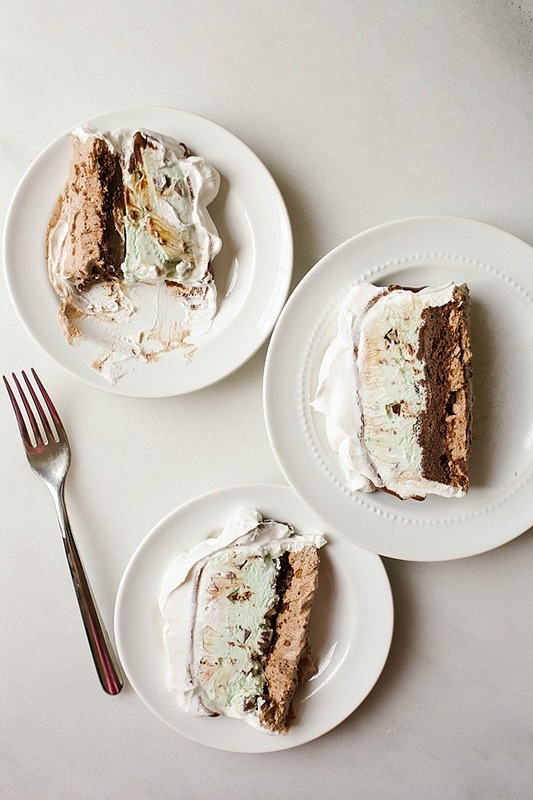 Give this mint brownie ice cream cake a try, and let me know how it goes! I strongly recommend going ahead and making it this week, wrapping it in foil, and saving it in your freezer for a rainy day. You never know when you might need that fancy trick up your sleeve. Cheers to you and have a terrific Tuesday! Preheat the oven to 300 degrees and spray your pan with baking spray. These brownies can be prepared in an 8” square/round pan, or, to prepare a loaf shaped ice cream cake as I did in my photos, bake in two bread loaf pans. In the bowl of a stand mixer, beat the eggs until light and fluffy, about 2 minutes. Add sugar and beat to combine, about 1 minute. Add the remaining ingredients and stir on low until combined. Pour the batter into the prepared pan(s) and bake until a toothpick inserted comes out clean. For an 8” pan, this will take about 40-45 minutes, and for two loaf pans, it will take about 20-25 minutes. Allow the brownies to cool completely before assembling the cake. You can speed up this process by cooling them in the fridge, or by preparing the day before. Pour half (7 ounces) of the sweetened condensed milk to a large mixing bowl or the bowl of a stand mixer. Add the cocoa powder and vanilla and beat until well combined and no lumps remain. Add one cup of the heavy whipping cream and beat the mixture until stiff peaks form. Set aside in the fridge while you prepare the remaining elements. Combine the remaining cup of heavy whipping cream, the remaining sweetened condensed milk, and the peppermint extract, and whip until stiff peaks form. Add two drops (more, if needed) of green food coloring towards the end of the whipping process, if desired. Fold in the chocolate or chocolate chips and set aside until ready to assemble the cake. In the bowl of a stand mixer or in a large mixing bowl, whip the cream on low speed until it is frothy. Increase speed to high, beating until soft peaks form. Add the sugar and the extract and beat until stiff peaks form. Set aside until ready to assemble cake. Place the chocolate in a heat proof bowl. Heat the cream in the microwave or on the stovetop until almost bubbling and steaming. Pour directly on top of the chocolate and cover the bowl with plastic wrap. Allow to sit for about five minutes. Stir with a whisk or rubber spatula until the chocolate comes together and is a smooth ganache. You can heat briefly in the microwave in 5 second increments if it remains a bit lumpy. If the ganache sets out too long, it will thicken back up, so just reheat in 10-15 second increments as needed. Line a loaf pan or an 8” springform pan with plastic wrap, leaving several inches worth of wrap extending over the sides. This will make the removal process easier. If preparing in a loaf pan, spread the mint ice cream evenly over the bottom of the pan. Sprinkle chocolate cookie crumbles over top and drizzle in some ganache or fudge sauce. Top with a layer of brownie (see notes). Spread the chocolate ice cream over top and smooth out. Cover with a layer of plastic wrap and freeze for at least 6 hours or overnight, if possible. When ready to frost, remove the cake from the pan to a serving dish. Peel off all of the plastic wrap and cover with whipped cream or topping. 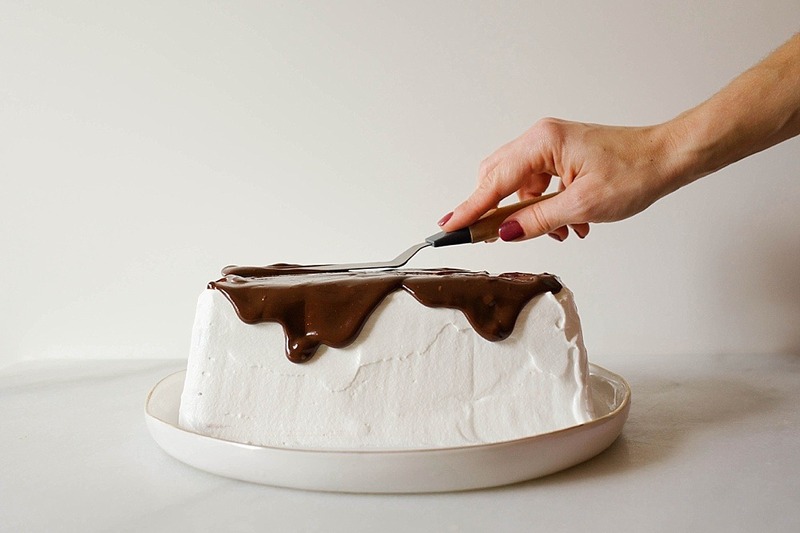 Drizzle the ganache over top and allow to freeze for 2-4 hours or until frozen solid, if desired. Alternatively, you can serve immediately, but keep in mind the hot ganache may melt the cake some. Serve frozen and keep covered with plastic wrap and foil to maintain freshness for up to a week. If you want to prepare the cake in a round springform pan, I recommend layering as follows: brownies, mint ice cream, chocolate cookie crumbles, ganache, chocolate ice cream. Then freeze your cake and frost with whipped cream as desired. Really you can assemble the cake in any manner you like, but the cake is easiest to cut when the brownies are toward the bottom. Feel free to use boxed brownies or store-bought prepared brownies. I prefer Ghiradelli Dark Chocolate Brownie mix when using boxed brownies. I recommend preparing your brownies in the pan you plan to assemble the cake in so that the brownie is the same size as the cake. However, you can also crumble your prepared brownies into the cake. It won’t make a difference on the final outcome of the cake. Instead of the chocolate ganache, you can substitute in a store bought hot fudge sauce. Melt slightly in the microwave in 15 second intervals until the sauce is melted but not too hot. Allow to cool slightly before pouring on your cake. You don’t have to use crumbled chocolate cookies in the cake, but the crunch is not. Alternatively, you could use some mini chocolate chips, Thin Mint Cookies, or even chocolate graham crackers! Hi, I am looking for the coconut cake recipe. Please send it to me. It looks divine. My anniversary is this week and want to surprise my hubby. He loves coconut cake.! definitely need to play around more with no churn ice cream (i did matcha a couple years ago and it was much less hassle than the normal stuff + it was delicious). and love that gentle shade of green instead of the neon yet somehow semi-pastel green mint chocolate chip ice cream typically is. could also stare at the cross-section of one of these slices for daysss.